The hotel restaurant has 80 seats for our guests all together. This area can be quickly re-arranged to meet all your requirements. The menu is changed several times a year and includes both Czech and international specialities. Special catering events are regularly held here. As well as the range of food on offer, there is a wide choice of alcoholic and non-alcoholic drinks. 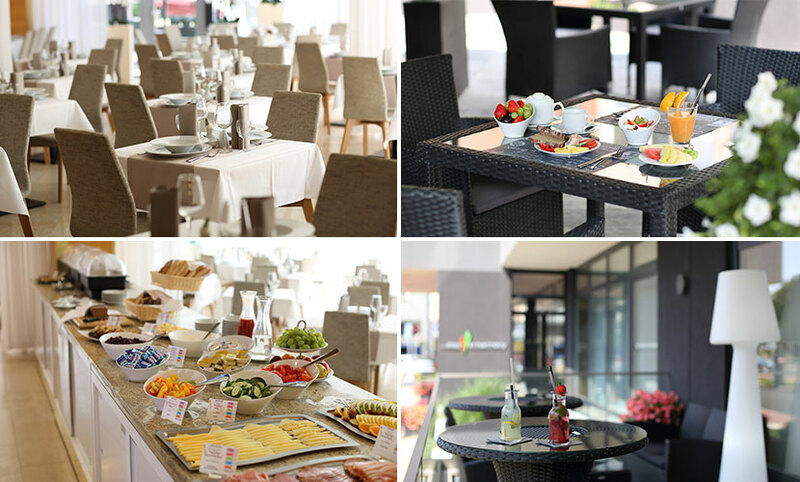 Every morning we offer here a buffet breafast, Monday - Friday from 6:30 till 10:00, weekends from 7:00 till 10:00. Also non-staying guests are welcome for our breakfast - cost is 190,- CZK / person and breakfast buffet, for group reservations we can offer each 10th person free of charge. Our hotel lobby bar is situated in the new entry hall and next to the reception. It has a total of 6 seats at the bar and 28 seats at the tables, in total 34 places . You can find there a wide range of drinks and small refreshments like baguettes, toasts or salads. It is also ideal for informal meetings. When the restaurant is closed, a full menu is provided here. In summer season, you can enjoy your refreshment on the terrace, which offers 12 comfortable seats overlooking the main street and surroundings the hotel. Part of the lobby bar is also an outside smoking area. The hotel is entirely non-smoking, but we do not forget about these guests and want to offer them a pleasant and cozy corner for their relaxation and well-being.